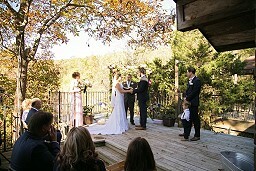 Azalea Falls Lodge offers a beautiful, natural setting for small outdoor weddings, receptions and special group events. 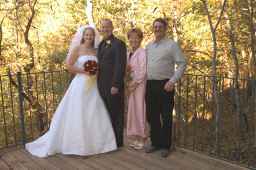 Located near the upper Buffalo Nation River, on 150 pristine acres, the dramatic staircases, rock patios, one mile hiking loop and the large deck, overlooking an 85 foot seasonal waterfall, will provide the perfect backdrop for a memorable celebration. We will be happy to help you design the perfect, personalized event. 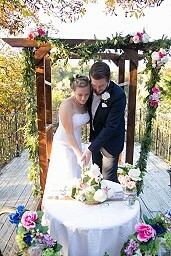 Or, if you prefer, we will provide the location and you can bring your dreams to life. 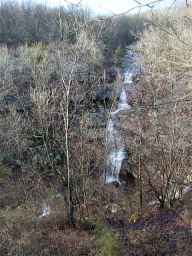 Large deck overlooking an 85 foot seasonal waterfall. 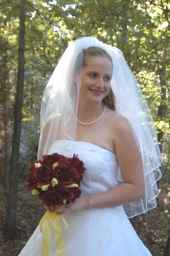 Lodging for up to 32 people in Azalea Falls Lodge, Azalea Falls Cabin and 3 rooms in Beauty Lodge B&B. Additional day guests are welcome (maximum is 50 persons). 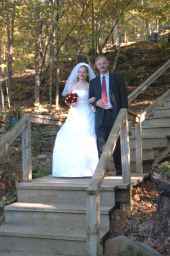 See Wedding Packages or Special Group Event Day Rates. Off-site catering is available. Call for menus and details. Servers available, if needed. Full kitchen, dishes, silverware, cookware and dishwasher. Satellite TV, VCR, DVD player, WiFi, stereo and meeting area. Outdoor seating, tables, linens for up to 50 people. 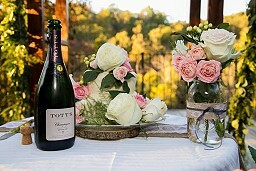 Complimentary bouquet, cookies, candy, champagne or sparkling beverage. Continental breakfast, if requested, for additional fee. Two large fireplaces in the lodge, one in the cabin – with firewood (in season). One mile hiking loop, fire pits and catch-and-release fishing pond. Grocery shopping service for additional fee. Plenty of parking and parking assistance if needed. Reservation may be secured by any major credit card. We will be very happy to help with any special needs you may have, such as ministers, wedding props, photographers or flowers. We can also help in arranging activities such as horseback riding, hiking, canopy tours, rock climbing, fishing or canoeing (in season). Just let us know what we can do to make your event perfect. If you would like to visit our facilities, we will be very happy to give you a tour and answer any questions. Please call to arrange an appointment. 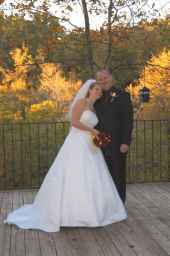 Weddings and receptions typically take place on the back deck of the lodge overlooking the seasonal 85 foot waterfall but we are flexible and will do our best to meet your needs and desires. Silverware, paper napkins, clear plastic plates and cups. Day rates (From 9am to 5pm). Two night minimum on the weekends.